Sony has recently announced on their PlayStation blog that adhocParty is coming to North America and other regions in the near future. As in Japan, this will be downloadable at no charge.adhocParty is an application for PlayStation 3 that allows users to play PlayStation Portable titles online. Titles commonly used with the application do not have their own infrastructure modes by default. This system allows players to connect remotely through the adhoc option of their games and play online over the PlayStation Network. This is done by accessing a series of lobbies and rooms. *The system also allows users to communicate using text and voice chat.Many (but not all) WiFi-capable PSP titles are supported by the application. Initially,*Phantasy Star Portable was not compatible with the service in Japan, however support was added soon after adhocParty's release. *It will most likely be supported in the initial release of the application here. Update: adhocParty is now available in North America. Joining it is a system update that adds Facebook features as well as a new look for the friends list. Phantasy Star Portable Officially Released! Today marks the official release of Phantasy Star Portable to the U.S. market. This latest addition to the Phantasy Star line-up lands on the Playstation Portable (PSP) and offers players the complete Phantasy Star Universe experience on the go! In addition to original content from Phantasy Star Universe and its expansion, Ambition of the Illuminus, Portable boasts a whole new storyline, new characters, and over 150 new items to find! Phantasy Star Portable is shipping to many stores now and our resident deal hunters tell us that Amazon is currently offering up the best bargain at $36.99 shipped! (see "More Buying Options" if the correct price isn't showing). Note: There are reports of stores still waiting to receive their initial shipments, so hang in there and good luck! 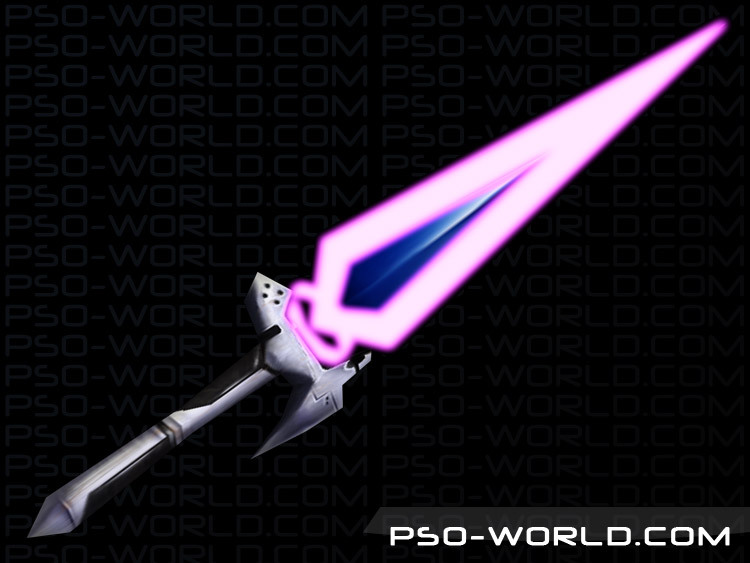 As many of you have noticed, PSO-World's item database is currently being updated to offer stats, screenshots, and information for items available in Phantasy Star Portable, and we'll be continuing to work on this. For any information we don't currently have listed, feel free to drop by the Phantasy Star Portable Forum. In addition, keep checking the home page this week for an announcement about our latest contest and prize giveaway. We have some copies of the game and some great Phantasy Star memorabilia to give out, you won't want to miss it!! In anticipation of next week's Phantasy Star Portable release, Sega of America was nice enough to provide PSO-World.com with exclusive screenshots of some of the awesome new weapons that will be appearing in the game! 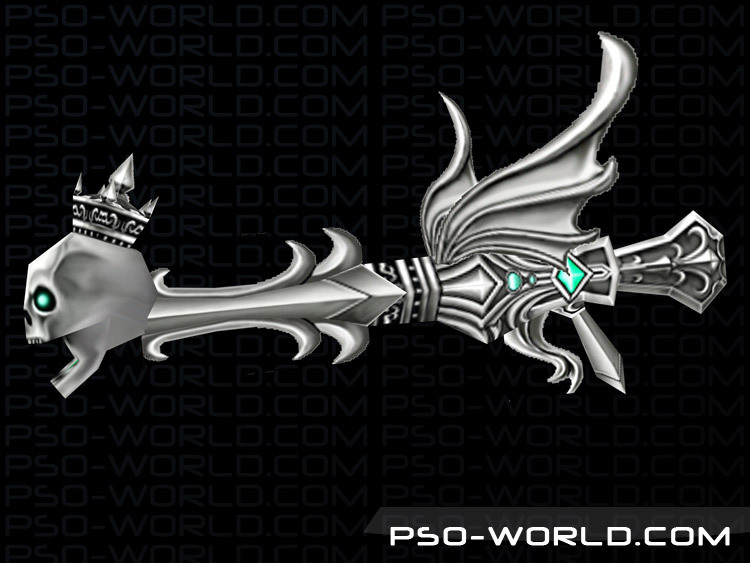 This collection includes three weapons from the Phantasy Star Online series, along with two brand new weapon designs! Scroll down to check out pictures and information for these weapons. Be sure to click on the thumbnails to see larger versions! 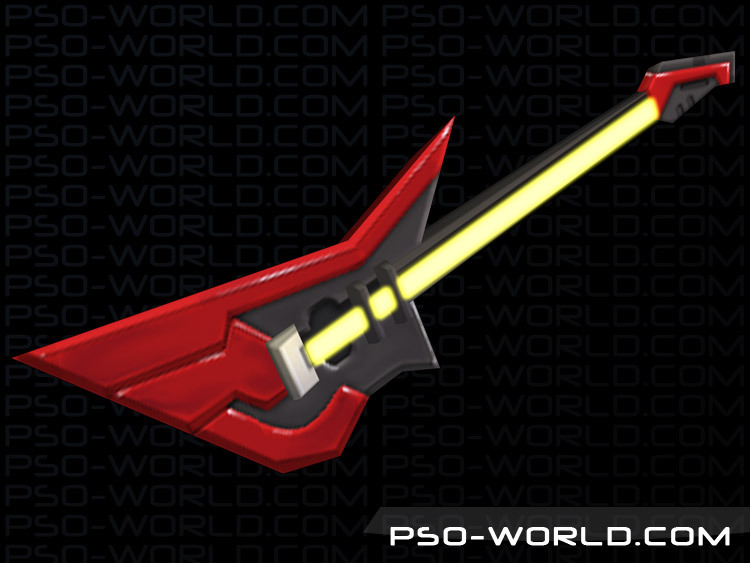 Description: A single-handed blade used by a certain Guardian who loved music. Old fogeys don't appreciate a raging electric guitar. Description: A wicked rifle said to be possessed by the dead. Death will visit all who stand before it. 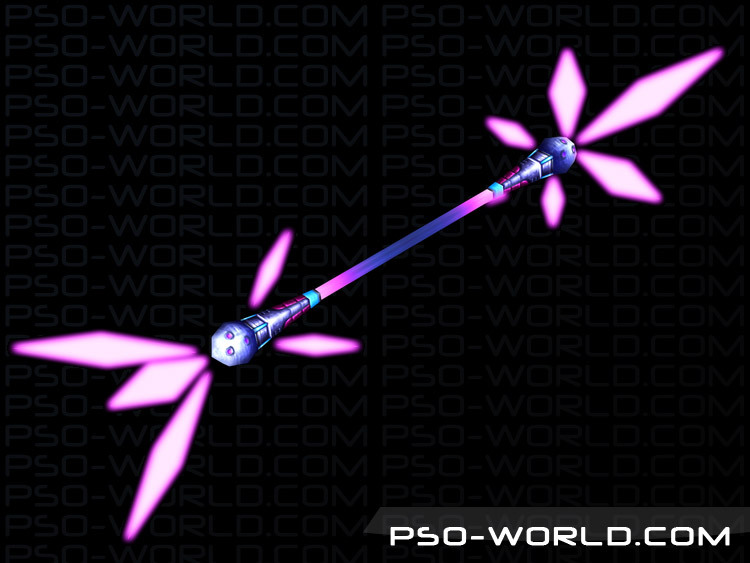 Description: A wand with star-shaped amplifiers at both ends. Its cute design makes it a popular accessory, too. Many thanks goes to Sega of America and RubyEclipse for providing these screenshots. Remember to visit PSO-World.com for all the latest Phantasy Star Portable news! Feel free to discuss the new pics over in our Phantasy Star Portable forum. An English version of the Phantasy Star Portable demo is now available at the Playstation Store! Players will be able to create a character, play through the first mission, and try out several missions in multi-mode. 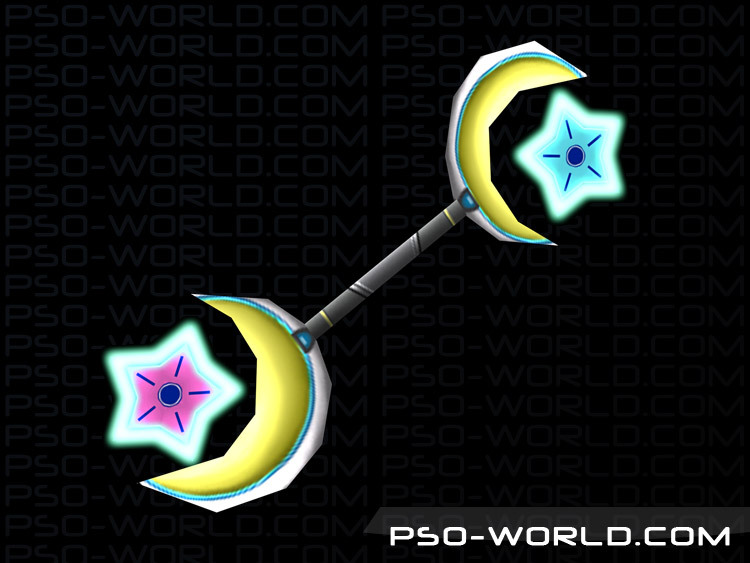 Also, a few PSP-exclusive weapons are available in the demo as rare drops. The demo is 272 MB and is rated E for everyone. Credit goes to RisingSun for bringing us this news. You can share your impressions of the demo in this PSO-World forum thread. According to this official blog post, Phantasy Star Portable is slated to appear March 3rd in the United States. * This date has appeared recently on a number of online retail sites, however this is the first mention by Sega themselves that they've narrowed down the date. A discussion post is already up in our forums. * There is just one month to go until release! Phantasy Star Portable Slated for March 2009 in U.S.! According to gaming news site 1Up.com, SEGA have confirmed that Phantasy Star Portable is scheduled to be released in the United States in March of 2009! An exact date within the month has not been revealed, but stay tuned as we'll be sure to report any information on that as it surfaces. Special thanks to Sydz for the news tip! Update: In an interview with director Satoshi Sakai, conducted by 1Up.com, it was confirmed that the localized release of Phantasy Star Portable will not support the character upload feature that the Japanese version has. To clarify, this only means that you will not be able to transfer the likeness of your character (with some items, Meseta and a small jump on leveling) from AOTI to PSP. Update: The official press release has been posted here. The initial batch of screens have been posted here. Just in case anyone had doubts that Phantasy Star Portable would decend upon the US market after its impressive launch in Japan, we've heard from sources that an official announcement is on the way. No further information has been passed on to us yet, but it sounds like Sega of America is gearing up for a US release of the title and that we can expect to see an official announcement of some kind in the near future. I guess you could call this an unofficial announcement of the official announcement. Be sure to keep an eye on PSO-World as we continue to follow the impending announcement and subsequent release of the US version of Phantasy Star Portable. Also, be sure to visit the PSP Forum to chat with other PSO-Worlders about this latest Phantasy Star title! According to IGN, the PlayStation Network will receive enhanced capabilities this fall with the PSP in mind. All models are of course supported. First off, the PlayStation Store will be accessible directly from a PSP. You can download the demo for Phantasy Star Portable (and other things) directly. * This is as opposed to using a PS3 or PC. Most excitingly, there will be infrastructure capabilities for PS3 owners. Many games that currently only support ad-hoc multiplayer will be able to be played online (without the use of a certain unofficial application). Users will not only be able to find games, but also be able to take advantage of text and voice chat. Monster Hunter Portable 2nd G is the first announced title to be supported. I imagine there is also room for a title that has cleared 600k copies (and is currently the 5th best selling PSP game in Japan). Gamasutra: I was amused to see the Phantasy Star Portable news, because it was like a lightbulb went off at Sega. "Maybe we should take our idea back from Monster Hunter!" Simon Jeffery: Right. (laughter) I think that's exactly what happened at Sega! Gamasutra: Capcom has had difficulty putting that model forward in the west, but Phantasy Star has done okay. Maybe not as well as it should, but okay. Simon Jeffery: It's done okay, and there's still quite a lot of people out there playing it every month. Gamasutra: So do you think you can take that market here with that title? Simon Jeffery: I think that it's not going to be a blockbuster success, but I think it will be a niche success. I'm certainly hopeful that it's more of a success in the west than Monster Hunter has been. There is a built-in audience for it already there. I think the crossover of the PSP ownership will work quite nicely, so we're fairly hopeful we can make something out of it. It's not going to be huge, but hopefully it'll be interesting. While a Western release has not been formally announced yet, these comments should be taken as strong indication that Phantasy Star Portable will be released outside Japan. Credit goes to Blueblur for spotting this interview. You can discuss this news in our Phantasy Star Portable forum.